Our bound journal collection has moved to Garey Hall, but never fear! We’re here to help you get the articles you need. 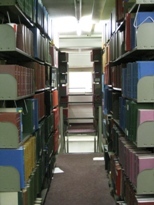 Even though the stacks are restricted (library staff access only), we will scan or retrieve the journals you need. The link to Interlibrary Loan on our home page will take you to the ILLiad patron login screen where you can request electronic delivery of articles from the Falvey Library or Garey Hall collections. It’s also used to request articles and books from libraries all over the world. As noted in a blog article by University Librarian Joe Lucia, “the items being transferred to the Garey Hall facility are mainly bound volumes containing historical runs of print journals and periodicals. A large percentage of this material is now available online. Approximately 100,000 volumes will be stored in Garey Hall once this project is complete.” The move of journals will make it possible for the library to create new spaces for users. The ILLiad all-purpose request form is used to process your request in the most efficient way possible, whether it’s an article from our bound journal collection or an article from a library across the country. We can often deliver your article within 48 hours. Our new Garey Hall services begin on Monday, August 23rd. If you prefer that we deliver the physical item from Garey Hall to Falvey for your perusal, use the Garey Hall retrieval request.